Der Artikel American Classics wurde in den Warenkorb gelegt. 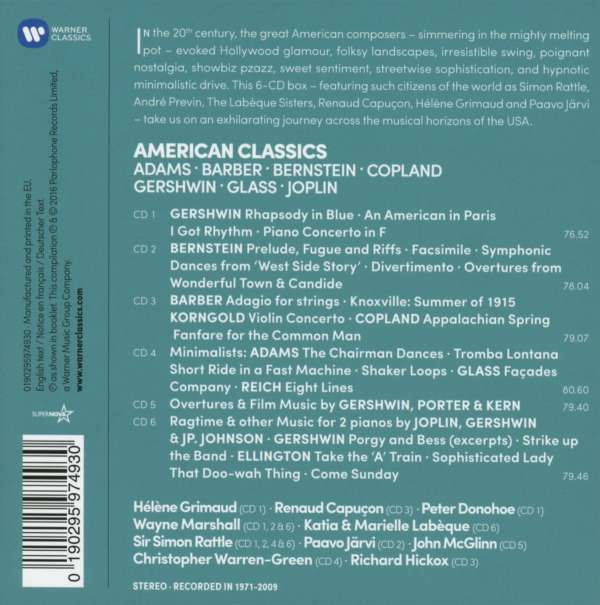 Künstler: Harolyn Blackwell, Damon Evans, Cynthia Clarey, Marietta Simpson, Helene Grimaud, Renaud Capucon, Peter Donohoe, Wayne Marshall, Katia & Marielle Labeque, Glyndebourne Chorus, Aalborg Symphony, Baltimore Symphony Orchestra, London Sinfonietta, London Philharmonic Orchestra, City of Birmingham Symphony Orchestra, Rotterdam Philharmonic Orchestra, London Chamber Orchestra, David Zinman, Simon Rattle, Christopher Warren-Green, Richard Hickox, Carl Davis, Paavo Järvi, Andre Previn u. a.
Hörprobe Track 18: Divertimento For Orchestra: Viii. In Memoriam - March "the Bso Forever"
Paavo Järvi: Divertimento For Orchestra: Viii. In Memoriam - March "the Bso Forever"
Hörprobe Track 4: Oh, Kay! : Overture: Oh, Kay! John McGlinn: Oh, Kay! : Overture: Oh, Kay!